On Friday during one of my classes, my professors were giving presentations on a week long NYC or LA immersion trips that television, radio and film students go on every January. As they discussed details of the trip, they also gave us a first hand account of what living in one of these cities would look like, as so many of us will be interning in these places after graduation. One of my professors was talking about starting out in Los Angeles. Every day when he went to work, he had $3 he could spend: $1 for bus fare to work, $1 for lunch at Taco Bell, and $1 for bus fare back home. Even though expenses were much cheaper back in his day, the struggle was definitely still real. Talk about a way up call! After I walk across the stage in May, I will be starting an internship and after hearing this story, I am both afraid and excited, and most of all, definitely sobered. It’s so easy for us as students to imagine the excitement of having that first job and doing what we love, that we begin to build a perception of life after Newhouse that’s pretty misconstrued. For most of us, we’e going to be broke, paying overpriced rent, working long hours for small pay, navigating a new huge city and struggling to make ends meet. We’re going to be away from our parents, away from our friends and away from the safety and comfort of life as we know it now. It wasn’t until I heard this story that I actually sat down and thought about the harsh possibilities I would be facing. After doing it, I remembered why I choose not to think about these things right now. But, as much as we don’t want to think about it, it is so important for us as students to prepare ourselves for the real world, and for a lot of us that means coming to terms with what things may really look like. Of course this sounds depressing and discouraging, but it is definitely necessary for success and following our dreams. It is important that we understand that things may get hard, we may have to struggle and we will miss our moms, but we have to remember to keep striving, failing forward and showing up. It will all be worth it in the end! Remember, you don’t have to be average you can be extraordinary. You don’t have to be rock, you can be a diamond. As I enter into my fall semester of the TRF grad program at Newhouse, I am overwhelmed with an array of emotions. I have found myself wondering how I got on this campus and back into classrooms after I vowed that I was done with syllabi and textbooks. I have found myself thinking about the security of the salaried job and steady paycheck I gave up to go back to being a broke college kid. I have found myself worrying about what it’s going to be like being a student again after taking a year and a half off. I have found myself reflecting on that decision I made to drop everything that was normal and safe to follow a dream. Taking a leap of faith as they call it, is the phenomenon of doing something where the outcome is unknown. It’s taking a step out of your comfort zone and trying something different. So many people consider taking a leap of faith to be something we do only when we are about to encounter something big and “life changing” and as a result, so many people are afraid to do it. However, we take leaps of faith every day. Everything after the present is unknown. We don’t know whats going to happen from one minute to the next, but we still choose to walk into the unknown of each new minute of the day without taking a second thought. So, why is it so hard to do on a conscious level? Stepping outside of life as we know it now and entering into something totally unknown is unpredictable, scary, and so many people fear it more than anything. We feel discomfort, fear, and anxiety when trying something new, and would rather cling to the safety of our comfortable and predictable lives. Taking a leap of faith almost always comes with many sacrifices and lots of change. Saying goodbye to certain ways of life that we don’t necessarily want to let go of, but have to let go of is one of the worse feelings ever. From moving away from family, to not being able to go to the movies every week, to what have you, it is so hard to focus on the big picture and the future when it means sacrifice, change, and discomfort in the present. I have a serious relationship with God and trust that he will take care of me. Knowing this keeps me from worrying and stressing out about things such as finances, post grad life, and all the things that are somewhat up in the air for me at times. It also helps me to remember that I am doing exactly what I’m supposed to be doing even though it’s scary. My parents, friends, and boyfriend are a big support to me. When I’m feeling down or unsure of my decision to pursue this degree, they remind me of why I’m here, encourage me to keep going , and put things back into perspective for me. I also have my peers here at Newhouse. I’m sure I’m not the only one who has moments of fear, worry, stress or what have you. Having my peers is a nice reminder that I am not alone and that others understand the exact feelings I’m having. It’s so easy to put all of my focus on the present simply because that’s where I am. When things get stressful or hard in the present, thinking about the bigger picture and reason why you’re feeling that way now is the last think I want to think about. Focusing on the big picture helps me to remember that everything I’m doing is for a greater purpose and a greater life for me, and by remembering that, I am motivated to keep moving. Taking a leap of faith is very scary and uncomfortable. However, don’t let discomfort and fear of the unknown stop you-be brave! Find a good set of coping mechanisms, utilize them to the fullest, and jump at your destiny. Sure, it will always be safer to stick to what you know and are comfortable with, but by doing that, you may never know your true potential and you may never know your true purpose. Take a chance on yourself and follow your dreams- if not you’ll regret it forever. Remember you don’t have to be average you can be extraordinary. You don’t have to be a rock, you can be a diamond! Well after six weeks of complete and utter chaos, I can finally say I have completed boot camp at Syracuse University! From sleepless nights, to unforgettable experiences, this has been one of the most life changing summers of my life. I’ve learned so many new things, have met some pretty amazing and talented people, and have discovered a strength and drive within myself that I didnt know existed! It’s so crazy how quickly things change from a dream and desire to being thrown into the deep end of reality. As scary as that is, I believe it’s an experience that every person following a dream should have. It’s so easy to think about a dream and what things will be like when you’ve achieved that dream, but the real test comes with actually doing it. The real test comes when you’re in the building and hard work stages- I believe that’s what determines how serious you are and where you learn how ready you are to follow your dreams. All in all, after this summer, I can say that I know I am ready to follow my dream. Is it going to be easy? Of course not. Is it going to happen overnight? No way. However, I’m up for the challenge. Check out my my first milestone, and short film I produced entitled, “One More Day”. Please give me feedback, share, and support! I would really appreciate it! Remember, you don’t have to be average, you can be extraordinary. You dont have to be a rock, you can be a diamond. You don’t have to be average, you can be extraordinary. 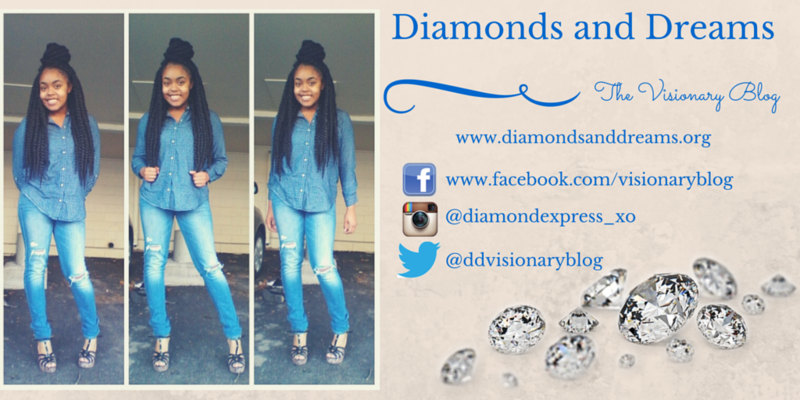 You don’t have to be a rock, you can be a diamond! The Road to Television: My first 2 weeks at Syracuse University! Hey everyone!!! As promised, here’s a video highlighting my first 2 weeks at Syracuse University!! Check out all the deets (and some cool photos) below! I hope you enjoyed!!!! Have any questions? Comment below!! Remember, you don’t have to be average, you can be extraordinary. You don’t have to be a rock, you can be a diamond! Be on the lookout for my next post about my first week of bootcamp at Syracuse University!!!! Sometimes in life we are put in situations that we don’t like. We are stuck doing things and being involved in things that we feel like we have no control over, but have no choice but to do it. Whether it be a person, a job, or a living situation, we start to feel trapped. Because we feel trapped and like we have no other options, we begin to settle for these bad situations. We begin to pretend that everything is great when it isn’t. We shift our mind to thinking that we are happy when we’re not. We begin to think that we’re satisified when we’re not. We begin to decorate our cage. Today I am encouraging us not to decorate our cages. Dont settle for people, situations, jobs, lives, or whatever way our cage decides to manifest itself that we aren’t happy with or satisfied with. When we’re feeling trapped in our cages and like we have no choice but to settle, remember that the key to freedom lies within us. However, finding it starts with a decision. It’s a decision to believe we’re worth more. It’s decision to realize that we don’t have to settle for anything less than extraoridnary and amazing. It’s a decision to follow a dream, to pursue a goal. It’s a decision to be happy- it’s decison to be free. Remember, you dont have to be average you can be extraordinary. You dont have to be a rock, you can be a diamond. In honor of Diamonds and Dreams Poetry Month, check out this amazing poet Frantzline Tingue sharing her poem, I’m Worthy. You’re nothing. You’re nobody. You are worthless. The words buzz at my ears and ache at my head. I remember them. They’re sharp and painful. I’m nothing. I’m nobody. I’m worthless. Nothing matters anymore. All I am and all I was is now gone. I sit at the end of the highway bridge. The cars zoom past behind me. Some cars beep. Do they see me? Do they wonder why I’m there? Why is she hanging out on the highway? Will she jump or is she just sitting there? Nah. Nevermind. They’re just there. They just are. And at the same time, they’re not. Just like I am to them. I stand up. I’m nothing. They’re nothing. We have our own lives. We just happen to live in the same world. But it doesn’t matter. But wait. If they’re nothing and I’m nothing and life goes on, why am I here? Why am I doing this? I think back. I remember the words again. Yeah. That’s right. I remember. How can I forget? We might all be nothing in the same world but I’m beneath them. So far from nothing. They drive their cars and live their life but I’m just here- sitting at the end of the highway bridge. They don’t beep at me. I have to remember the words. I have to remember who I am. I’m nothing. I’m nobody. I’m worthless. I take a step and look down. There’s water and large rocks. I take a breath. A deep breath. I can do this. I’m not a wimp. I’m not a punk. I can do this. I take another deep breath. I can hear them laughing. They’ll see. They’ll all see. They’ll regret their words. They’ll hurt so much that they’ll all do the same. I hope they will. I hope they can’t stand themselves. I hope they grab a gun and pull the trigger. Take a knife and jab it in. Take those pills and choke on them. Walk to a bridge and fall. Anyway. Anyhow. I just hope it’s done. I jump. I’m falling. The wind is blowing in my ears. My hair flying all over the place. My eyes are wide. My face flabbing. My arms whalling. I can’t relax. What have I done? I’m falling. I’m falling to my death. It’s gonna hurt. There will be pain. My heart aches. I let out a scream. I’m screaming. I’m falling. OH GOD HELP ME! TAKE ME! I DIDN’T THINK THIS THROUGH! I’M NOT NOTHING! I’M SOMETHING! I’M SOMEBODY! I’M WORTHY! I MATTER! GOD! CAN YOU HEAR ME? SAVE ME! I shake awake. I’m in my bed. I’m alive. I’m not falling. I’m not hurting. They are tears in my eyes. I remember my words. I’m something. I’m somebody. I’m worthy. I matter. I won’t ever think less or let someone else force me to believe that I’m worthless. When we were children, we were told that success was in finding happiness. Success was fulfilling our desires, regardless of what they were. We were told that success was achieving our goals. Stop telling us that a 5/6 figure piece of paper is the only way. Stop telling us that working hard means working like a dog for 40 hours a week. Stop telling us we’re too “fresh out of college”, even though we’re qualified. Stop telling us stereotypes never play a part. We were told to be brave and try even if we were afraid. We were told that we had the strength, the drive, the power. Stop telling us what you think our worth should be. Stop telling us what you think we’re capable of. Stop telling us there’s a cap on our potential. Stop telling us there’s a limit. We were told to be “true to you”. Stop telling us to stay in society’s box. Stop telling us to stick to the status quo. Stop telling us to play it safe. Stop telling us to conform. When we were, children we were told to have a dream. Told to touch the sky and be starry eyed. We were told to soar high and go far. Stop telling us it’s risky. Stop telling us it’s unrealistic. Stop telling us the odds are against us. Stop telling us what the statistics say. Stop telling us it’s not possible. Stop telling us it’s unlikely. Stop telling us we’re wasting my time. Stop telling us it’s too late. Tell us that we can defy the odds. Tell us we can step out of the box. Tell us that it’s possible. Tell us we can succeed. Tell us that we are powerful. Tell us to follow our desires. To embrace the dreams we have. Tell us we don’t have to let go. Tell us we can look back. To when we were children with starry eyes. To when it was okay to truly believe. In the gift of having a dream.